Getting the proper anti-freeze to the proper place at the proper time is fundamental to preventing downtime and increasing productivity with compressed air lines. 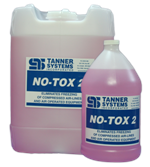 To stop air line freeze-ups, introduce a few drops of a Tanner De-icant into your airline using a Tanner Dispenser. Once the Tanner De-icant is introduced into the air line, the fluid bonds to the moisture in the air stream, prevents it from freezing and allows it to exhaust through the pneumatic components. A Tanner Dispenser precisely delivering a Tanner De-icant: that’s a Tanner system. Economical — Easy to Install — Easy to Use. How Much Does a Tanner System Cost? The only costs are the purchase of the Tanner Dispenser and the Tanner De-icant as needed. Starting at a few hundred dollars, a Tanner System is far less costly than expensive air dryers. The truly important comparison, however, is to the enormous cost of being shut down!